AXPONA is the USA’s largest regional audio show. It takes place this weekend at the Renaissance Schaumburg Hotel & Convention Center in Chicago. I won’t be there. Ha! As with every year, this Stateside event is too close to Munich High-End to justify punching a 12-day hole in my review schedule: five days to get to and from Chicago; five days to report on what I saw; and two or three more days for the double dose of jetlag to subside. My show attendance caution doesn’t begin and end with scheduling. A seasoned listener acknowledges the impossibility of commenting on sound quality beyond that of a complete system in a room. A perspective that regrettably puts paid to any attempts to single out an individual component’s contribution to the whole. A thoroughly seasoned listener knows a) that the room is the single most important component in any loudspeaker system; and b) that listening rooms at home rarely if ever approximate the size and/or acoustic make-up of a show’s (hotel) room. Now we kiss goodbye to reliably judging loudspeaker performance. Putting loudspeakers that make an attempt to sidestep the room’s influence to one side (think: Kii Three and Dutch & Dutch et al), what we hear at a show is rarely a reliable indicator of what we might hear at home. We can ascertain its general flavour (is that chocolate or strawberry?) but in talking to a loudspeaker’s finer points (do I detect a hint of almond? or is that pistachio? ), we should exercise caution. And yet it is those finer points that so often make or break a purchasing decision. This reduces audio show demos to the status of a show n’ tell. A place to ogle what’s new – to hear manufacturer sale pitches – but with a view to conducting further listening elsewhere – at a local dealer (better) or home (best), where we control the A/B comparisons and the music selection. For exhibitors not conducting A/B demos at shows, would a static display not suffice? That’s a conversation for another day. In Chicago this weekend, PS Audio will give AXPONA attendees a peek at their forthcoming statement DAC that will reportedly begin shipping in Q4 of this year. Like the immensely popular DirectStream DAC, the Obsidian Series Signature DAC has been designed by Ted Smith. Per the header image above, the Ted Smith Statement DAC (TSS) is a two-box affair that galvanically isolates analogue and digital sections via a custom fibre-optic link. Expect the price to land somewhere between US$20,000 and US$25,000. According to PS Audio PR, the statement DAC will reportedly “exceed the performance of six-figure units”. Here we cut through the marketing boasts to ask “Which six-figure DACs?”. The super-affable Ted Smith, Bill Leebens and PS Audio CEO Paul McGowan will be on hand to answer these questions and more. Visitors grumbling about the TSS’s static display should ask themselves how they might hope to isolate the TSS’s performance if it were hooked into the show system? Only if McGowan and co. were to swap out the DirectStream DAC for the TSS would we be any the wiser to keep our bragging rights (“Yeah, I heard that at AXPONA and it sounded great!”) fully intact. The most we can claim without an A/B swaperoo is: “Yeah, I heard a system featuring that DAC at AXPONA but I can’t reliably tell you how it sounds”. Not quite as catchy or insightful, is it? 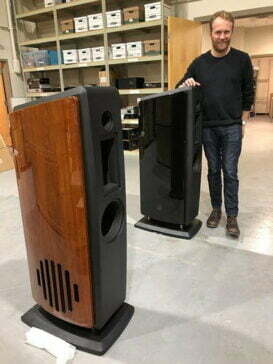 PS Audio will also be showing a pair of prototype AN3 loudspeakers at AXPONA. The AN refers to the late Arnie Nudell upon whose work the loudspeakers are based. The AXPONA visitor, like any other hotel-based show visitor, is invited to listen to the AN3 but also consider the room in which the AN3 sit. How does it compare to the listening room at home? What are the room’s dimensions? How high is the ceiling? Is it carpeted or does it have a hardwood floor? Are the loudspeakers firing from the long or the short wall? This line of inquiry isn’t restricted to PS Audio or AXPONA — these are questions we should ask of every audio show exhibitor if we are still to see a hotel-based audio show as a suitable venue for auditioning loudspeakers (or electronics). And if audio show hardware auditions are fraught with insurmountable challenges, why attend at all? Being there to get hands on with a speaker’s fit and finish or turning an amplifier’s volume knob tells us more about build quality than could a show report or press release. Further, a handful of exhibitors will conduct A/B demos throughout AXPONA’s 3-day run. Synergistic Research (opposite registration booth) and AudioQuest (rooms #304, #306, #1414, Inspiration 1) will be showing the before and after-effects of their power products and if you ask Voxativ’s Holger Adler nicely (room #1524), he might demonstrate the audible differences between an iPhone and an aptX-capable Android smartphone with his Absolut black box. Shows like AXPONA give us what we cannot get at home: a weekend of seminars, face-to-face time with product designers and time to chat with fellow audio enthusiasts. In other words, a broader sense of community — invaluable when most of us listen home alone. Munich High-End 2019: ELAC’s Carina are JET-powered!